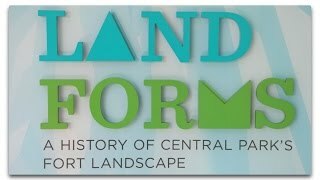 Spaeth Design - "Landforms Exhibit" at the Central Park Conservancy Stop by the Charles A. Dana visitor center in Central Park. We completed an exhibit called, 'Land Forms' which opened April 15th. Land Forms features models and information about the landscape, geological formation, and overall design of the park. A great place for kids and adults to learn more about the park we all know and love. In August of 2015, the team at Spaeth Design collaborated up with BBDO to create Lowes' "Fix in Six" animated windows. Each window came with a like button and loop counter and were created to show how you can save space in your home! These displays were built for the opening of Lowes' in Chelsea, New York City and were a big hit! Please like, share and leave us a comment! Party on a Mountaintop Video Booth Experience When Poor Boyz Productions, the leader in action sports media production, was asked by a client to create a video booth experience that would transport party goers instantly to the peaks of a mountain range, they turned to scenic and visual experts, Spaeth Design, as a partner to flesh out the experience. Together, PBP and SD, combined strengths to form an unbeatable team and delivered a truly unique experience for the client. In 2014 Spaeth Design created holiday windows for Tiffany & Co. They displayed Tiffany's holiday jewelry line and featured their signature purple and teal color scheme. These windows were much smaller than others we've done in the past, so attention to detail was even more of a challenge! Tiffany and Co were awarded the Silver Award, 3rd place for the best holiday windows in New York City! In the 2014 season Spaeth Design created 6 holiday windows for Saks Fifth Avenue. The theme of the windows was "Classic Fairy Tails" featuring scenes from Snow White, Sleeping Beauty, Rumplestiltskin, Little Red Riding Hood, Repunzel and Cinderella. These windows won the Platinum Award, 1st place for the best windows in New York City! In 2014 Spaeth Design created holiday windows for Bloomingdale's, Tiffany & Co and Saks Fifth Avenue. Tiffany & Co were presented with the Silver Award (3rd Place) and Saks Fifth Avenue was given the Platinum Award (1st Place) for best holiday windows in New York City! Here are some fun highlights of those displays. 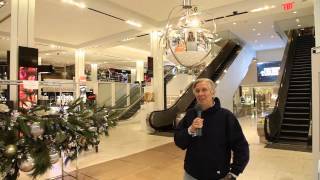 In this episode of Making Magic at Spaeth Design, CEO David Spaeth walks us through the process of designing, building and installing this years Macy's Ornaments! Each ornament that we created has a specific theme! Head over to Macy's Herald Square on Broadway and 35th Street in NYC to check them out! Share your experience with us on our website or Facebook page! In this episode of Making Magic CEO David Spaeth asks some our team members what they think about this years Lord and Taylor window displays. We also take a look at some of the previous windows we've done for Lord and Taylor! Please join us for the window unveiling event on Thursday, November 13th at Lord and Taylor on 5th Avenue and 38th Street in New York City! Making Magic at Spaeth Design - Episode 6 Halloween is right around the corner, and the team at Spaeth Design has created spooky displays for Dylan's Candy Bar in New York City! CEO David Spaeth explores the challenges of making these candy skull heads and talks with Ricolla, one of the artists who helped make this display possible! This past winter, Spaeth Design moved from Manhattan to Woodside, Queens! Learn about the production space they now call home and meet Ryan, our CNC technician. 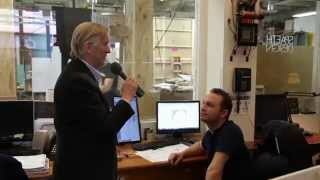 Ryan, along with CEO David Spaeth, explains how the CNC Router is used and why its such a crucial machine to have in the workshop! 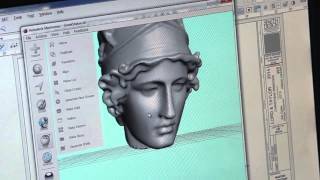 In this episode of Making Magic, CEO David Spaeth checks in with designer Chris Dopher, and they go over how Spaeth Design uses the 3D printer to create the custom elements that go into their elaborate displays. In the second episode of 'Making Magic' CEO David Spaeth checks in with Technical Director Greg Westby and they discuss the challenges of creating displays for a client in Sao Paulo, Brazil. CEO David Spaeth has decided to give the public an inside look at some of the projects and the happenings around the Spaeth studio. In this episode, Spaeth team member Jimmy puts the finishing touches on a 16ft by 16ft book before it is crated and sent to T Galleria by DFS in Waikiki. Spaeth Design's C.E.O, David Spaeth and Director of Technology Matt Elliot, explain why their magical animations have filled the windows of department stores around the globe. Discover how the team has adapted to the vast changes in technology, and how they've learned to incorporate it in each theatrical display they create. In May of 2014, Spaeth Design created three miniature displays for Hermes' "All About Women" event in Downtown Manhattan. Each scene was designed to help brand a series of new Hermes watches. Get a behind the scenes look at the creative process and see it all come together. The Magic Windows TRAILER - OFFICIAL Come with us on a journey to a magical world where everyday is Christmas. Meet the family of artists from Spaeth Design, who have been creating holiday window displays for major retailers for decades. For the first time ever, a production company was granted access to tell the story of the magic behind these extravagant window displays. Through process shots and in-depth interviews, this film showcases the creative process of New York City's Macy's, Lord and Taylor, Saks Fifth Avenue, Bloomingdale's and Bergdorf Goodman holiday windows from the 2012 season. Discover a story as beautiful as their work, and remember what it is like to be a kid on Christmas. Behind the Scenes: Macy's Believe-O-Meter & Spinning Holiday Ornament 2013 Take a look at Macy's Believe-O-Meter and Spinning Holiday Ornament, built and designed by Spaeth Design. Catch a glimpse of what it takes to make these magical works of art. Located on on 6th Avenue between 34th and 35th Street! Take a look at Saks Fifth Avenue's 2013 Holiday Windows, built and designed by Spaeth Design. Catch a glimpse of what it takes to make these magical works of art. Located on 5th Avenue between 49th and 50th Street in New York City. 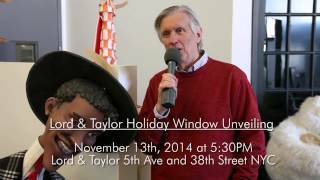 Take a look at Lord and Taylor's 2013 Holiday Windows, built and designed by Spaeth Design. Catch a glimpse of what it takes to make these magical works of art. Located on 5th Avenue between 38th and 39th street in New York City. T GALLERIA WAIKIKI REBRANDING EXTRAVAGANZA On Saturday, September 7th, 2013 DFS Galleria was rebranded T-Galleria, choosing Spaeth Design to help them with display showpieces for the event! Luckily, the Gnarlabs team was there to capture it all! Tuesday's Children is a Non-profit organization providing support and services for the children of 9/11 and others impacted by global terrorism. 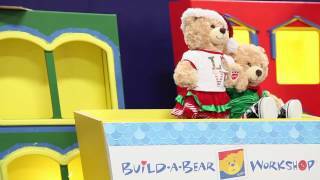 Spaeth Design, creators of New York City's animated Christmas window displays opened their doors for a tour of their facility and a behind the scenes look at how they make their magical window displays for some of the members of Tuesday's Children. Spaeth Design Halloween 2012 Here are some cool Halloween costume ideas from the artists at Spaeth Design!